For other uses, see Search and rescue (disambiguation). United States Coast Guard: "The use of available resources to assist persons or property in potential or actual distress." United States Defense Department: A search is "an operation normally coordinated by a Rescue Coordination Center (RCC) or rescue sub-center, using available personnel and facilities to locate persons in distress" and rescue is "an operation to retrieve persons in distress, provide for their initial medical or other needs, and deliver them to a place of safety." One of the world's earliest well-documented SAR efforts ensued following the 1656 wreck of the Dutch merchant ship Vergulde Draeck off the west coast of Australia. Survivors sent for help, and in response three separate SAR missions were conducted, without success. On 29 November 1945, a Sikorsky R-5 performed the first civilian helicopter rescue operation in history, with Sikorsky's chief pilot Dmitry "Jimmy" Viner in the cockpit, using an experimental hoist developed jointly by Sikorsky and Breeze. All 5 crew members of an oil barge, which had run aground on Penfield Reef, were saved before the barge sank. In 1983, Korean Air Lines Flight 007 with 269 occupants was shot down by a Soviet aircraft near Sakhalin. The Soviets sent SAR helicopters and boats to Soviet waters, while a search and rescue operation was initiated by U.S., South Korean, and Japanese ships and aircraft in international waters, but no survivors were found. In July 2009, Air France Flight 447 was lost in the middle of the Atlantic Ocean. An international SAR effort was launched, to no avail. A third effort nearly two years later discovered the crash site and recovered the black boxes. In early 2014, Malaysia Airlines Flight 370 crashed under mysterious circumstances. Many nations contributed to the initial SAR effort, which was fruitless. In June 2014, the Australian Transport Safety Bureau commissioned the MV Fugro Equator to lead a three-month survey of the ocean bed, for which it had budgeted $60mn; at the same time, Malaysia announced it had spent $9.3mn to date on fuel and food in its own effort. The search for Flight 370 has become the largest SAR so far with the largest budget. Mountain rescue relates to search and rescue operations specifically in rugged and mountainous terrain. Ground search and rescue is the search for persons who are lost or in distress on land or inland waterways. Traditionally associated with wilderness zones, ground search and rescue services are increasingly required in urban and suburban areas to locate persons with Alzheimer's disease, autism, dementia, or other conditions that lead to wandering behaviour. Ground search and rescue missions that occur in urban areas should not be confused with "urban search and rescue", which in many jurisdictions refers to the location and extraction of people from collapsed buildings or other entrapments. Some ground search teams also employ search and rescue dogs. Urban search and rescue (US&R or USAR), also referred to as Heavy Urban Search and Rescue (HUSAR), is the location and rescue of persons from collapsed buildings or other urban and industrial entrapments. Due to the specialized nature of the work, most teams are multi-disciplinary and include personnel from police, fire and emergency medical services. Unlike traditional ground search and rescue workers, most US&R responders also have basic training in structural collapse and the dangers associated with live electrical wires, broken natural gas lines and other hazards. While earthquakes have traditionally been the cause of US&R operations, terrorist attacks and extreme weather such as tornadoes and hurricanes have also resulted in the deployment of these resources. Combat search and rescue (CSAR) is search and rescue operations that are carried out during war that are within or near combat zones. Air-sea rescue (ASR) refers to the combined use of aircraft (such as flying boats, floatplanes, amphibious helicopters and non-amphibious helicopters equipped with hoists) and surface vessels, to search for and recover survivors of aircraft downed at sea as well as sailors and passengers of sea vessels in distress. High seas highlighted in dark blue. The Geneva Convention on the High Seas, aka UNCLOS I, is an international treaty created in 1958 to codify the rules of international law relating to the high seas, otherwise known as international waters, and is one of four treaties created at the United Nations Conference on the Law of the Sea. This treaty contains the definition of high seas, at Article 1.
International Search and Rescue Advisory Group (INSARAG) is a UN organization that promotes the exchange of information between national urban search and rescue organizations. International waters are divided by the IMO's Maritime Safety Committee into 13 regions as an addendum to the SOLAS convention; these regions were subdivided by various later conventions. The International Convention on Maritime Search and Rescue was signed in 1979, entered into force in July 1985, and governs SAR operations to present day. In the Arctic, SAR responsibilities are since May 2011 governed by the Arctic Search and Rescue Agreement. after a collision, to render assistance to the other ship, its crew and its passengers and, where possible, to inform the other ship of the name of his own ship, its port of registry and the nearest port at which it will call. A ship should not be subject to undue delay, financial burden or other related difficulties after assisting persons at sea; therefore coastal States should relieve the ship as soon as practicable. to supply the Organization with pertinent information concerning the findings of such investigations. Each State shall cause an inquiry to be held by or before a suitably qualified person or persons into every marine casualty or incident of navigation on the high seas involving a ship flying its flag and causing loss of life or serious injury to nationals of another State or serious damage to ships or installations of another State or to the marine environment. The flag State and the other State shall co-operate in the conduct of any inquiry held by that other State into any such marine casualty or incident of navigation. International Maritime Organization (IMO) Resolution MSC.255(84), of 16 May 2008, adopts the Code of the International Standards and Recommended Practices for a Safety Investigation into a Marine Casualty or Marine Incident. It is also known as the Casualty Investigation Code. It is meant to govern collaborative investigations into very serious casualties which are defined at paragraph 2.22 as "a marine casualty involving the total loss of the ship or a death or severe damage to the environment". A rescue air crewman aboard Westpac Life Saver Rescue Helicopter Service Lifesaver 1 in action. The Australian search and rescue service is provided by AusSAR, which is part of the Australian Maritime Safety Authority (AMSA). AusSAR operates a 24-hour Rescue Coordination Centre (RCC) in Canberra and is responsible for the national coordination of both maritime and aviation search and rescue. AusSAR is also responsible for the management and operation of the Australian ground segment of the Cospas-Sarsat distress beacon detection system. AusSAR's jurisdiction spans Australia and as well as covering 52.8 million square kilometres of the Indian, Pacific and Southern Oceans constituting about 12% of the Earth's surface. AusSAR's RCC is staffed by SAR specialists who have a naval, merchant marine, air force, civil aviation or police service background. The RCC also coordinates medical evacuations, broadcasts maritime safety information and operates the Australian Ship Reporting System (AUSREP). In coordinating search and rescue missions, AusSAR will call on assistance from organisations as appropriate, such as the Defence forces, Border Protection Command, trained aviation organisations (Civil SAR Units), emergency medical helicopters, state Police services and trained Air Observers from the State Emergency Service. There are also other organisations, such as the non-profit Westpac Life Saver Rescue Helicopter Service that is based at a number of sites around Australia and contracted by various authorities to deliver search and rescue services. BSAR searchers at Mount Dom Dom. State Police in many states operate state-based search and rescue squads, such as the Victoria Police Search and Rescue Squad, which provides specialist expertise, advice and practical assistance in land search and rescue on most terrain including snow and vertical cliff search and rescue. There are also state-based volunteer search and rescue groups such as the Bushwalkers Wilderness Rescue Squad in New South Wales and Bush Search and Rescue Victoria in Victoria. These state-based groups draw searchers from bushwalking, mountaineering and specialist rescue clubs within their State. A few groups respond on horseback as mounted search and rescue. The State Emergency Service is a collection of volunteer-based emergency organisations established in each state or territory which are responsible for many rescue efforts in urban and rural areas and in any rescue that results from flood or storm activity. In rural areas the SES conducts most bush search, vertical and road traffic rescues. In urban areas they assist the police and fire services with USAR. Search and rescue operations in Azerbaijan are managed by the Ministry of Emergency Situations onshore in cooperation with the State Civil Aviation Administration in air and the State Maritime Administration offshore. Search and rescue duties along the Belgian part of the North Sea are executed by the Belgian Air Component. From its Koksijde Air Base it operates 5 Westland Sea King Mk.48 helicopters. Search and rescue duties in Brazil are the responsibility of the Divisão de Busca e Salvamento (D-SAR) (English: Search and Rescue Division), of the Brazilian Air Force. Canadian Forces CC-115 Buffalo fixed wing SAR aircraft from 442 Transport and Rescue Squadron. Search and rescue duties in Canada are the responsibility of the Canadian Forces and Canadian Coast Guard in conjunction with provincial and municipal governments and private organizations. The Department of National Defence (DND) has overall responsibility for the coordinated search and rescue system. SAR operations are organized by Joint Rescue Coordination Centres (JRCC). The JRCC are manned 24 hours a day by SAR Co-ordinators from the Canadian Coast Guard and Canadian Forces. Authority for the provision of maritime SAR is assigned to the Minister of Fisheries and Oceans by the Canada Shipping Act and the Canada Oceans Act. The Royal Canadian Mounted Police (RCMP) and other police forces also coordinate ground search and rescue (GSAR) operations, often using volunteer GSAR teams operating in specific districts under provincial coordinating bodies. The Canada Shipping Act, most recently passed in 2001, is the framework document that funds international SAR activities. North Shore Rescue, British Columbia. In Croatia the SAR Service is part of the Croatian Navy and the Croatian Coast Guard with their headquarter in Rijeka. The Cyprus Republic Search and Rescue (SAR) system is organized by the Cyprus Joint Rescue Coordination Center (JRCC Larnaca). The JRCC (Greek: Κέντρο Συντονισμού Έρευνας και Διάσωσης) is an independent agency of the Ministry of Defence of the Republic of Cyprus that started its operations on a 24h basis on 7 August 1995 as a unit of the Cyprus Air Force Command. On 1 March 2002, the JRCC took full responsibility for investigating, organizing, coordinating and executing every SAR incident-operation in the Republic of Cyprus Search & Rescue Region (SRR). JRCC Larnaca operated as a military unit until 26 July 2010, when JRCC was transformed to an independent agency under the Ministry of Defence with the Minister being responsible for its operational aspects. Logistic and technical support is the responsibility of the Ministry of Communications & Works. Its primary mission is to organize the Cyprus Republic Search And Rescue system, to co-ordinate, control and direct SAR operations in its area of responsibility (which is identical to the Nicosia FIR), in order to find and rescue people whose lives are at risk, as a result of an air or naval accident, in the least possible time. This is achieved by coordinating all the different agencies involved such as the Cyprus Police Aviation Unit, the Cyprus Port and Naval Police, the Cyprus National Guard Naval Command, the Cyprus National Guard Air Force Command, the Cyprus Civil Defence and other secondary units. The JRCC reports directly to the operational control of the Ministry of Defence and it is staffed by qualified personnel of the Cyprus National Guard, mainly from the branches of the Navy and the Air Force. Search and Rescue operators in Denmark are primarily: Danish air force Squadron 722, Danish navy air squadron, naval home guard and the Danish Maritime Safety Administration, coordinated by the Joint Rescue Coordination Centre, operated by the navy and air force in the Danish Naval Commands facilities near Aarhus. Internationally the Danish works mainly with Germany, Norway and Sweden. With the two latter, the annual exercises Baltic SAREX and Scan-SAR are conducted. SAR services in Denmark started in 1957 with seven Sikorsky S-55s. Their piston engines produced only 550 hp (410 kW) and they had limited fuel capacity, so their operational range was short. To increase the operational area, Pembroke twin-engined fixed-wing aircraft were employed for search. These aircraft would localize the distressed person(s) and the S-55s would then rescue them. The SAR service was started for respond to fighter-plane crashes as 79 aircraft crashed, with 62 dead, in the period 1950-1955., but civilian SAR duties are also conducted. In 1962 eight ship-based Aérospatiale Alouette IIIs were received. These were primarily meant for the ships patrolling the North Atlantic, but also supported the S-55s. In 1964 - 1965 the seven S-55s were replaced with eight Sikorsky S-61A helicopters. This helicopter was originally designed for anti-submarine warfare, but the Danish variant had the heavy dipping sonar equipment removed and extra fuel tanks added, giving the helicopters longer range. In 1977 radar was installed and in 1990 FLIR was added. Further avionics and navigation systems, including GPS, have also been added over time. In 1977 the naval air squadron was re-established as an independent squadron in the navy and had their Alouette IIIs replaced with Westland Lynx helicopters. Their primary operational area was still the North Atlantic, but they continued their support role, although this was reduced with the introduction of the S-61s. 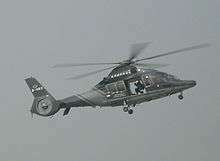 In 2006, the first of the S-61s was replaced by one of 14 new AgustaWestland EH101 Merlin helicopters. Wikimedia Commons has media related to Rescue helicopters in Denmark. In 2007 the Danish Defence held a public display in Horsens, to raise awareness about rescue services and maritime safety. Maritime SAR is important because Denmark has a relative long coast line to its land mass. 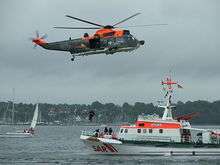 In 2008 the SAR forces in Denmark were equipped with eight EH-101, one or two Lynx, 34 naval home guard vessels and 21 rescue vessels as well as the naval vessels at sea. The EH-101s operate from bases in Aalborg, Skrydstrup and Roskilde. When the sea water temperatures are low a helicopter is also deployed to the island of Bornholm in the Baltic Sea. The Lynx operates from Karup. Maritime vessels are spread out through the entire coastline and on islands. 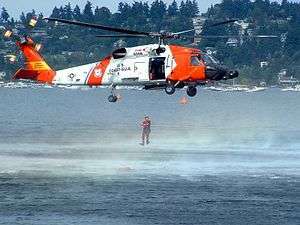 The S-61s and EH-101s have a crew of six: Two pilots, a navigator, a flight engineer, a physician and a rescue swimmer. SAR training by the Estonian Border Guard. The Estonian Border Guard (Piirivalve) is the Estonian security authority responsible for the border security. It is the main support organisation for search and rescue missions in Estonia, and operates a small fleet of SAR vessels and helicopters. In Finland local rescue services (i.e. fire departments) are responsible for land and inland water SAR, the Border Guard is responsible for maritime areas. These organizations alert and decide on the most suitable response for the location and situation. The country also has several volunteer organizations such as the volunteer fire department (VPK), the Finnish Lifeboat Institution (SMPS) and the Red Cross Finland (SPR). Search and Rescue in German waters is conducted by the German Maritime Search and Rescue Service with air support by the German Navy and the German Air Force. All incoming requests are coordinated by the Maritime Rescue Coordination Center in Bremen. The DGzRS is a non-governmental organization entirely supported by donations. Besides the offshore Search And Rescue services, the German Air Force provides 3 SAR Command Posts on a 24/7 basis with the Bell UH-1D Huey. Further, the Technisches Hilfswerk is a key component of the German disaster relief framework. It is, among other things, regularly involved in urban search and rescue efforts abroad. SAR operations are conducted by the Government Flying Service (GFS) and before 1993 by the Royal Hong Kong Auxiliary Air Force. The GFS conducts maritime SAR within the 400-nautical-mile (740 km) radius of the Hong Kong Flight Information Region (FIR). The Icelandic Coast Guard is responsible for coordinating all maritime and aviation search and rescue activities in the Icelandic Search and Rescue Region (SRR), that has the size of 1.9 million square kilometres. The Icelandic Coast Guard operates JRCC ICELAND in combination with the Coast Guard's operation centre, the maritime traffic service and the coastal radio stations. If aircraft crash site is located on land the control of the rescue operations is diverted to the Icelandic Police, which is responsible for SAR operations on land. The Icelandic Coast Guard (JRCC ICELAND) is the Cospas-Sarsat SAR Point of Contact. ISAVIA, which operates the Air Traffic Control in Iceland, is responsible for the aviation alerting services. The Icelandic Coast Guard operates maritime patrol aircraft, SAR helicopters and patrol vessels. The Icelandic Association for Search and Rescue (Slysavarnafélagið Landsbjörg) (ICESAR) is a volunteer organization with about 100 rescue teams located all around the island. ICESAR is a great support to SAR operations both on land and sea. All the rescue teams contain groups of specially trained individuals. A specialized INSARAG External Classification certified rubble rescue squad operates under the Icelandic Association of Search and Rescue. It was the first rescue squad to arrive in Haiti following the earthquake of 2010. A search and rescue demonstration by an Irish Coast Guard Sikorsky S-61 helicopter and a RNLI lifeboat. SAR services are provided by a civilian body: the Irish Coast Guard. It has responsibility for the Irish Search and Rescue Region. The waterborne element of Search and Rescue is provided by the Royal National Lifeboat Institution from 43 lifeboat stations including inland stations at Enniskillen and Lough Derg, the coastguard inshore rescue boats, and community rescue boats at fifteen stations: Ballinskelligs - Co. Kerry, Ballybunion - Co. Kerry, Ballyheigue - Co. Kerry, Banna - Co. Kerry, Bantry - Co. Cork, Bunmahon - Co. Waterford, Cahore - Co. Wexford, Carna - Co. Galway, Corrib/Mask Lakes - Co. Galway, Derrynane - Co. Kerry, Limerick City (River Shannon), Mallow Search and Rescue - Co. Cork, Schull - Co. Cork, Tramore - Co. Waterford, Waterford City River Rescue, Waterford Marine Search & Rescue. There are some 25 other independent rescue services. Mountain Rescue in Ireland is provided by 12 voluntary teams based in different regions of the country. The Irish Defence Forces are assigned from time to time to carry out search and rescue operations. Ireland's special forces, the Army Ranger Wing have been used for search and rescue operations in difficult or dangerous operations on land and at sea. The Irish Naval Service frequently assists the other agencies in search and rescue. Its patrol ships at sea and the communications center at Haulbowline maintain a 24-hour watch on all distress frequencies. The Irish Air Corps are used for rescue and provide top cover for search and rescue over land or sea. SAR in Israel is the responsibility of the IDF Home Front Command Search and Rescue (SAR). The unit was established at its current strength in 1984, combining all the specialist units that were involved with SAR until that time. The SAR unit is a rapid mobilization force and has an airborne transport and deployment capability for its personnel and equipment. The unit is composed of reserve personnel, with a regular cadre based at the Bahad 16 Unit training facility. With a focus on urban SAR, the unit operates specialized equipment, including a locally developed device for locating persons trapped under rubble by detecting seismic and acoustic emissions given off by the victims. The SAR unit also uses Search and rescue dogs specially trained to locate people buried under debris. Italian AgustaWestland AW139 for sea rescue. Italian SAR operations are carried out by the Guardia Costiera, backed up by naval aviation and the air force, including 15 ° Stormo, the Corps of the National Alpine and Speleological Rescue, the Meteomont Rescue Team, the Italian Red Cross, the national Corps of Firefighters and other organizations. These organizations are coordinated by Control Rooms and Secondary Coordination Centres, which are connected together, creating the National System for Search and Rescue (SAR). Jordan’s Civil Defense Urban Search and Rescue team (USAR) has achieved the UN classification as a heavy USAR team. The team's role mainly earthquake rescue. The Macau Marine Department and responsible for maritime SAR within Macau's waterways. The Macau Search and Rescue Coordination Centre is under the Vessel Traffic Control Centre of Macao of the Maritime Administration of Macau. The AFM's search and rescue launches Melita I and Melita II have been used for search and rescue operations since 1999. The responsibility for SAR at sea in the Malta Search and Rescue Region falls under the Armed Forces of Malta (AFM). It is carried out by maritime patrol aircraft, helicopters and vessels under the co-ordination, command and control of the Rescue Co-ordination Centre. The AFM, in close collaboration with the US Coast Guard, also runs a Search and Rescue Training Centre for International Students  in Maritime SAR Mission Co-ordination and Planning. To date more than 30 foreign students from 15 countries including Albania, Cameroon, Croatia, Equatorial Guinea and Kenya have attended these courses. Malta is also in talks with Libya about enhancing SAR cooperation between the two countries. SAR responsibility in the Netherlands is held by the Royal Netherlands Coast Guard, carried out by vessels and aircraft from various organisations among which mostly the Koninklijke Nederlandse Redding Maatschappij with 40 fast rescue vessels and between 1824 til 2006 answered 36358 distress calls and rescued in that same period about 79887 people out of distress situations, the Ministry of Transport, Public Works and Water Management and the Navy and Air Force. New Zealand's Search and Rescue Region extends from the South Pole to the southern border of the Honolulu region, including Norfolk, Tonga, Samoa, and Cook Islands. Smaller searches are controlled by the local police, who call on LandSAR for land-based operations, such as for lost hikers known as tramping in New Zealand, and the Royal New Zealand Coastguard for coastal maritime incidents. Larger maritime search and rescue events, as well as reports of overdue aircraft, fall under the control of the Rescue Coordination Centre New Zealand (RCCNZ), based in Avalon, which coordinates response from local coastguard, helicopter operators, merchant marine, air force and naval resources. Urban Search and Rescue falls primarily within the domain of the New Zealand Fire Service, particularly the three USAR Taskforce groups based in Palmerston North, Christchurch, and Auckland. These teams draw together numerous specialists and organisations to achieve an integrated multi-agency response. Among those organisations that act in a support capacity for NZFS are Response Teams (NZRTs). These are regional rescue groups of professional volunteers that train to a minimum industry standard of USAR Category 1R (USAR Responder), which is also standard for NZFS firefighters. Response Teams are registered with the Ministry of Civil Defence and Emergency Management (MCDEM), and assist their local MCDEM Groups and communities in emergencies to supplement full-time emergency services. Their additional capabilities, which vary among different teams, include: high angle rope rescue, storm response, swift water response, medics, welfare, and rural fire support. Many Response Teams were deployed to assist in the rescue and recovery effort of the 2011 Christchurch earthquake. New Zealand Land SAR Search Dogs - the official NZ search dogs group providing land search & rescue services under NZ Land SAR, wilderness and avalanche rescue dogs. The search and rescue helicopters are operated by the Royal Norwegian Air Force (RNoAF), who fly 12 Westland Sea Kings. The Norwegian Sea Kings are due to be replaced. Three different agencies are responsible for providing search and rescue in Portugal. The Portuguese Navy is responsible for all sea rescues, the Portuguese Air Force for all the rescues originating within the airspace, including aircraft crashes and the Autoridade Nacional de Protecção Civil (ANPC) for all inland rescues. All of the above coordinate closely with each other providing a comprehensive search and rescue service. The Portuguese area of responsibility comprises the Lisbon and Santa Maria Flight Information Regions (FIR). In Poland most search and rescue operations are undertaken by the airborne units of the Polish Armed Forces. The Navy currently has the largest SAR fleet of helicopters and also operates a number of small vessels for the purpose of rescuing crewmen of stricken ships. There is also, however a semi-governmental organisation known as the 'Morska Służba Poszukiwania i Ratownictwa' (Maritime Search and Rescue Service) which provides the vast majority of seaborne services to vessels in distress; the service is currently (as of 2010) in the process of overhauling and replacing a large portion of its fleet of lifeboats. Search and Rescue services are offered by various government departments, non governmental organizations, commercial/private organizations and voluntary organizations organisations in South Africa. There is no single organisation responsible for urban, wilderness, swift water, aviation or maritime/sea rescue. Aviation and maritime incidents are the responsibility of the South African Search and Rescue Organization (SASAR). SASAR is a voluntary organization that functions under the auspices of the Department of Transport. Its main role is to search for, assist and carry out rescue operations for the survivors of aircraft or vessel accidents. Depending on the nature of the accident, the RCC's (ARCC or MRCC) coordinate the search and rescue missions. These operations are carried out by other government departments, non governmental organizations, commercial/private organizations and voluntary organizations. CASA CN-235 Maritime Patrol aircraft of the Sociedad de Salvamento y Seguridad Maritima. The Swedish Maritime Administration is responsible for maritime SAR in Swedish waters. The Sjöräddningssällskapet, or Swedish Sea Rescue Society is an organization aiming at saving lives and recovering property at sea, much the same as the Norwegian Norsk Selskab til Skibbrudnes Redning. The society operates 68 search and rescue stations and some 185 ships manned by 2100 volunteers, of those more than 300 are on call at any time, and can respond within 15 minutes. In 2011, the volunteers turned out to an emergency 3274 times. The Swedish Sea Rescue Society is involved 70% of the number SAR missions in Swedish waters. REGA (Schweizerische REttungsflugwacht / Garde Aérienne / Guardia Aerea) is the air rescue service which provides emergency medical assistance in Switzerland, notably in mountains but also in cases of life-threatening emergencies elsewhere. They will also return a citizen to Switzerland from a foreign country if they are in need of urgent medical care. Rega was established on 27 April 1952 by Dr. Rudolf Bucher, who thought that the Swiss rescue organisation needed a specialised air sub-section. National Airborne Service Corps (NASC; Chinese: 內政部空中勤務總隊; pinyin: Nèizhèngbù Kōngzhōng Qínwù Zǒngduì) is the agency of the Ministry of the Interior of the Republic of China responsible for executing and providing support for search and rescue, disaster relief, emergency medical service, transportation, monitoring, reconnaissance and patrol in Taiwan. Coast Guard Administration (Taiwan) (CGA; Chinese: 行政院海岸巡防署; pinyin: Xíngzhèngyuàn Hǎi'àn Xúnfáng Shǔ) is charged with maintaining coastal waters and the pelagic zone patrols, smuggling and stowaway crackdowns, maritime rescues, natural resource conservation, and public services. The CGA is considered a civilian law enforcement agency under the administration of the Executive Yuan, though during emergencies it may be incorporated as part of the Republic of China Armed Forces. In Ukraine search and rescue is conducted by the State Search and Rescue Aviation Service of the Ministry of Emergencies of Ukraine Ukraviaposhuk. In the UK, maritime search and rescue is coordinated by the Maritime & Coastguard Agency (MCA) while aeronautical rescue is delegated through the UK Ministry of Defence to the Royal Air Force, and land-based operations are usually coordinated by the local Police force. The operation itself is carried out with aircraft from the Royal Navy, Royal Air Force or Coastguard, RNLI or independent lifeboats and police, military or volunteer mountain rescue or ALSAR (Association of Lowland Search and Rescue) teams. Aeronautical rescue and associated aircraft coordination is carried out by the UK Aeronautical Rescue Coordination Centre (ARCC) based at RAF Kinloss in the north of Scotland. The centre is responsible for tasking and coordinating all of the UK's search and rescue helicopter and RAF mountain rescue teams. The Merchant Shipping Act 1995, among others, governs casualty investigations and flag registrations for UK-flagged shipping and fishing vessels, and it is under s304 of this Act that the funds for the operation of the SOLAS region are disbursed. 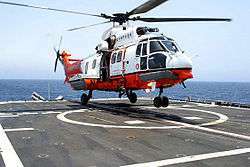 In 2006, the government announced controversial plans to effectively privatise provision of search and rescue helicopters in order to replace the aging Sea Kings currently in use, although it suggested that crews might, at least partially, still be made up of military personnel. In February 2010, Soteria SAR was announced as the preferred bidder for the UK SAR programme. On 8 February 2011, Soteria was disallowed the contract due to irregularities regarding the conduct of its bid team, and a spending review carried out by the new Conservative Government. The programme, SAR-H, was re-opened for bids on 28 November 2011. The £1.6 billion contract was awarded to Bristow Helicopters, to take over UK SAR operations by 2017. The new service will operate Sikorsky S-92 helicopters from existing MCA bases at Stornoway and Sumburgh, and at new bases at Newquay, Caernarfon and Humberside airports. AgustaWestland AW189 helicopters will operate from Lee-on-Solent, Prestwick, and new bases at St Athan, Inverness and Manston Airports. In the United States there are many organizations with SAR responsibilities at the national, state and local level. In January 2008, the United States Department of Homeland Security (DHS) released the National Response Framework which serves as the guiding document for a federal response during a national emergency. Search and Rescue is divided into 4 primary elements, while assigning a federal agency with the lead role for each of the 4 elements. In the U.S., SAR standards are developed primarily by ASTM International and the U.S. NFPA which are then used by organizations such as the Mountain Rescue Association (MRA), the U.S. National Association of Search and Rescue (NASAR), and the NFPA to develop training that will meet or exceed those standards. Within ASTM International, most standards of relevance to SAR are developed by Committee F32 on Search and Rescue. Formed in 1988, the committee had 85 current members and jurisdiction of 38 approved standards. National Committee of Search and Rescue is responsible for searching, rescuing and disaster relief. Central Committee of Prevention of Natural Disasters is responsible for analyzing information and monitoring disaster relief processes. General Staff: Department of Rescue of Vietnam People's Army is responsible for coordinating all military rescue activities (including ground force rescue activities). Navy: Office of Rescue of Vietnam People's Navy is responsible for coordinating naval rescue activities. Air Force: Office of Rescue of Vietnam People's Air Force is responsible for coordinating air force rescue activities. Coast Guard: Office of Rescue of Vietnam Coast Guard is responsible for coordinating coastal rescue activities. Border Guard: Office of Rescue of Vietnam Border Defense Force is responsible for coordinating border rescue activities. Department of Fire and Rescue Police is responsible for fire fighting activities. 1 2 Canadian Forces (May 1998). "B–GA–209–001/FP–001 DFO 5449 NATIONAL SAR MANUAL" (PDF). Archived from the original (PDF) on 2008-08-03. Retrieved 2008-07-12. ↑ "Search and Rescue - Chapter 9". uscg.mil. Retrieved 26 February 2015. ↑ U.S. Department of Defense (January 2006). "U.S. Department of Defense DIRECTIVE NUMBER 3003.01" (PDF). Retrieved 2008-07-12. ↑ "MH370 search continues as Australia commissions Dutch vessel to map Indian Ocean floor - Daily Mail Online". Mail Online. Retrieved 26 February 2015. ↑ "Search For Flight MH370 Reportedly Largest In History". NPR.org. 17 March 2014. Retrieved 26 February 2015. ↑ Barry, Ellen (December 1999). "Alzheimer's Wanders Stir Concerns". Retrieved 2010-01-11. ↑ U.S. Department of Homeland Security (May 2009). "Urban Search and Rescue (US&R)". Retrieved 2010-01-11. ↑ U.S. Department of Homeland Security (May 2009). "About US&R". Retrieved 2010-01-11. ↑ SPG Media Limited/Army-Technology.com (2009). "Term: Combat Search and Rescue". Retrieved 2009-06-03. ↑ See the map provided by the IMO ocean atlas Archived November 20, 2012, at the Wayback Machine. ↑ unhcr.se (December 2011). "UNHCR: RESCUE AT SEA, STOWAWAYS AND MARITIME INTERCEPTION, Selected Reference Materials 2nd Edition" (PDF). Archived from the original (PDF) on 6 June 2014. Retrieved 31 May 2014. ↑ "RESOLUTION MSC.255(84)" (PDF). Retrieved 3 October 2012. 1 2 3 Australian Maritime Safety Authority (June 2009). "Search & Rescue". Retrieved 2009-11-04. ↑ State of Victoria (June 2007). "Victoria Police Search and Rescue Squad". Retrieved 2009-11-04. ↑ Bushwalkers Wilderness Rescue Squad Inc (November 2009). "A remote area search & rescue service for NSW". Retrieved 2009-11-04. ↑ Bush Search; Rescue Victoria (October 2009). "Bush Search and Rescue Victoria". Retrieved 2009-11-04. ↑ State of New South Wales (December 2008). "About the SES". Retrieved 2009-11-04. ↑ Rashad Suleymanov (2009-10-27). "Azerbaijan State Maritime Administration issues statement on rescuing Russia's cargo ship". Azeri Press Agency. Retrieved 2010-12-28. ↑ Belgische Defensie (2009). "Vliegbasis Koksijde (Dutch language)". Retrieved 2009-11-04. ↑ "Busca e Salvamento (in Portuguese)". ↑ Royal Canadian Mounted Police (December 2006). "RCMP Search and Rescue". Retrieved 27 October 2010. ↑ Air Force Public Affairs / Department of National Defence (November 2011). "103 Search and Rescue Squadron". Retrieved 8 April 2012. ↑ Air Force Public Affairs / Department of National Defence (December 2008). "413 Transport and Rescue Squadron". Retrieved 8 April 2012. ↑ Air Force Public Affairs / Department of National Defence (August 2010). "424 Transport and Rescue Squadron". Retrieved 8 April 2012. ↑ Air Force Public Affairs / Department of National Defence (December 2008). "435 Transport and Rescue Squadron". Retrieved 8 April 2012. ↑ Air Force Public Affairs / Department of National Defence (October 2011). "442 Transport and Rescue Squadron". Retrieved 8 April 2012. ↑ Air Force Public Affairs / Department of National Defence (April 2012). "417 Combat Support Squadron". Retrieved 8 April 2012. ↑ Air Force Public Affairs / Department of National Defence (December 2008). "439 Combat Support Squadron". Retrieved 8 April 2012. ↑ Air Force Public Affairs / Department of National Defence (April 2012). "444 Combat Support Squadron". Retrieved 8 April 2012. ↑ Canada Task Force 2 (2010). "Canadian Task Force Two". Retrieved 24 July 2011. ↑ Civil Air Search and Rescue Association (2006). "Civil Air Search and Rescue Association National Website". Retrieved 2009-05-11. 1 2 "ERT Search and Rescue". ↑ Technical Search and Rescue (2010). "Technical Search and Rescue". Retrieved 2010-01-18. ↑ "Halifax Regional Search & Rescue". halifaxsar.ca. Retrieved 26 February 2015. ↑ North Shore Rescue (2009). "North Shore Rescue". Retrieved 2009-03-21. ↑ "Pincher Creek Search & Rescue". Archived from the original on 2004-06-13. Retrieved 28 July 2012. ↑ Québec Secours (2009). "Québec Secours". Retrieved 2009-05-08. ↑ Nocturne Communications (2004). "River Valley Ground Search and Rescue". Archived from the original on February 7, 2007. Retrieved 2009-04-07. ↑ Roberts Bank Lifeboat (January 2010). "Roberts Bank Lifeboat". Retrieved 2010-01-20. ↑ "About RCM-SAR". Rcmsar.com. Retrieved 2012-07-11. ↑ Sauvetage Bénévole Outaouais - Ottawa Volunteer Search and Rescue (December 2014). "Sauvetage Bénévole Outaouais - Ottawa Volunteer Search and Rescue (SBO-OVSAR)". Retrieved 2014-12-29. ↑ "Search and Rescue Manitoba". September 2010. Retrieved 2010-09-13. ↑ Canadian Task Force One (2010). "Canadian Task Force One". Retrieved 2010-01-18. ↑ "York Sunbury Search and Rescue - Home". yssr.nb.ca. Retrieved 4 July 2015. ↑ "OCEAN7 - das österreichische Yachtmagazin | OCEAN7 2013 » News-Archiv: SAR, mehr Einsätze in Kroatien". Ocean7.at. Retrieved 2014-06-28. ↑ "Danish air force S-61A fact sheet" (PDF) (in Danish). Archived from the original (PDF) on 2008-08-03. Retrieved 2008-07-09. ↑ "Pictures from the public display". Archived from the original on September 27, 2007. Retrieved 2008-07-09. ↑ "Piirivalve ajalugu ja sümboolika (In Estonian language)". ↑ Suomen Pelastusalan Keskusjärjestö. "Turvalliseen huomiseen (Finnish language)". Retrieved 2009-09-21. ↑ Suomen Meripelastusseura Ry. "SAR - Search and rescue (Finnish language)". Retrieved 2009-09-21. ↑ Punainen Risti (n.d.). "Finnish Red Cross". Retrieved 2009-09-21. ↑ "German Maritime Search and Rescue Service (DGzRS)". Retrieved 2008-08-27. ↑ rth.info (2002). "Bundeswehr (in German language)". Retrieved 2008-05-22. ↑ "Search and rescue". Retrieved 2010-01-21. 1 2 "The Government Flying Service". Hong Kong Special Administrative Region Government. August 14, 2008. Retrieved 15 May 2010. ↑ "Civil Aid Service Hong Kong". Safety Training. Government of the Hong Kong Special Administrative Region. 2010. Retrieved 15 May 2010. ↑ Icelandic Coast Guard (n.d.). "The Icelandic Coast Guard". Retrieved 2008-03-07. ↑ Slysavarnafélaginu Landsbjörg (n.d.). "ICE-SAR A Tale of Great Achievements". Retrieved 2008-03-07. ↑ Skógarhlíð (January 2010). "Reports from Haiti". Retrieved 2010-01-23. ↑ Department of Transport. "Irish Coast Guard IRCG". Retrieved 2015-02-20. ↑ Department of Transport. "The Irish Search and Rescue Region". Retrieved 2015-02-20. ↑ "RNLI Lifeboat Stations in Ireland". Royal National Lifeboat Institution. Retrieved 6 October 2009. ↑ "Coastguard Teams". Irish Coast Guard. Retrieved 6 October 2009. ↑ "Community Rescue Boats Ireland". Irish Water Safety. 2 April 2014. Retrieved 2 April 2014. ↑ "Community Rescue Boats Ireland (CRBI)". Retrieved 17 February 2015. ↑ Mountain Rescue Ireland (2009). "Team Information". Retrieved 2010-01-05. ↑ "Info Centre - Defence Forces". military.ie. Retrieved 26 February 2015. ↑ "Organisation". military.ie. Retrieved 26 February 2015. ↑ Army Ranger Wing (ARW) carry out Mountain Rescue Archived February 22, 2009, at the Wayback Machine. ↑ "Organisation - Naval Service - Defence Forces". military.ie. Retrieved 26 February 2015. ↑ The Home Front Command (n.d.). "Combat SAR battalions Shahar and Kedem". Retrieved 18 May 2011. ↑ Capitanerie di porto - Guardia Costiera (2006). "Capitanerie di porto - Guardia Costiera". Archived from the original on 2008-07-29. Retrieved 2008-11-11. ↑ "Il portale dell'Aeronautica Militare - 15° Stormo". difesa.it. Retrieved 26 February 2015. ↑ Croce Rossa Italiana. "Croce Rossa Italiana - Home". www.cri.it. Archived from the original on 7 February 2015. Retrieved 26 February 2015. ↑ "SDC Iraq, Jordan, Lebanon and Syria - News Detail". Swiss-cooperation.admin.ch. 2013-05-23. Retrieved 2013-07-21. ↑ Maritime Administration (n.d.). "Maritime Services". Retrieved 2010-01-11. ↑ Search and Rescue Training Centre - Armed Forces of Malta (2004). "Search and Rescue (SAR) in Malta". Retrieved 2008-03-13. ↑ "Search and Rescue training". YouTube. 2007-11-29. Retrieved 2012-04-08. ↑ Search and Rescue Training Centre - Armed Forces of Malta (2004). "Search and Rescue Training Centre - AFM". Retrieved 2008-03-13. ↑ U.S. Department of State. (November 2007). "AFM SAR TC Graduation". Archived from the original on December 25, 2007. Retrieved 2008-03-13. ↑ Brincat, Erika F. (n.d.). "Search and rescue training certificates awarded". Retrieved 2008-03-13. ↑ MaltaMedia News. (January 2008). "Search & Rescue meeting between Libya and Malta". Retrieved 2008-03-15. ↑ NLMARFOR (May 2008). "VGSQ 7 (Dutch language article)". Retrieved 2008-05-30. 1 2 Civil Aviation Auithority of New Zealand (n.d.). "AIPA New Zealand GEN 3.6 Search and Rescue". Retrieved 2008-02-24. ↑ "About our Rescue Coordination Centre New Zealand (RCCNZ)". Maritime New Zealand. n.d. Retrieved 30 May 2010. ↑ Maritime New Zealand (n.d.). "Contact RCCNZ". Retrieved 30 May 2010. ↑ "New Zealand Fire Service - Urban Search and Rescue (USAR)". Fire.org.nz. Retrieved 2012-04-08. ↑ "The Ministry of Civil Defence & Emergency Management: NZ Response Teams". Civildefence.govt.nz. 2011-01-14. Retrieved 2012-04-08. ↑ "Search Dogs New Zealand Official Search & Rescue Dogs NZ Land SAR Search Dogs". searchdogs.co.nz. Retrieved 26 February 2015. ↑ The NAWSARH Project Archived January 30, 2010, at the Wayback Machine. ↑ "Força Aérea Portuguesa". emfa.pt. Retrieved 26 February 2015. ↑ "Santa Maria Oceanic FIR - Portugal vACC". portugal-vacc.org. Retrieved 26 February 2015. ↑ "Morska Służba Poszukiwania i Ratownictwa". sar.gov.pl. Retrieved 26 February 2015. ↑ SASAR (n.d.). "Who are we?". Retrieved 2008-11-13. ↑ Wilderness Search; Rescue, Western Cape (n.d.). "Wilderness Search and Rescue, Western Cape". Retrieved 2009-11-06. ↑ The Off Road Rescue Unit (n.d.). "The Off Road Rescue Unit". Retrieved 2014-09-11. ↑ Rescue South Africa (n.d.). "Rescue South Africa". Retrieved 2011-08-26. ↑ K9 Search and Rescue (n.d.). "K9 Search and Rescue". Retrieved 2014-09-11. ↑ Salvamento Marítimo (n.d.). "Salvamento Marítimo (Spanish)". Archived from the original on March 30, 2010. Retrieved 18 May 2011. ↑ Swedish Maritime Administration (January 2011). "Maritime Search and Rescue". Retrieved 29 April 2011. ↑ "Vi räddar liv till sjöss". Retrieved 9 March 2012. ↑ "Error 404; Seite nicht gefunden". rega.ch. Retrieved 26 February 2015. ↑ "AN OUTLINE OF INTERIOR AFFAIRS. REPUBLIC OF CHINA 2013-National Airborne Service". Moi.gov.tw. 2013-12-03. Retrieved 2014-04-22. ↑ "Coast Guard Administration, Executive Yuan-Our Minister-A Word from the Minister". cga.gov.tw. Retrieved 4 July 2015. ↑ (Ukrainian)The page of the Ukrainian Search and Rescue at the Ministry of Emergencies website Archived January 2, 2011, at the Wayback Machine. ↑ ARCC Kinloss (2005). "Aeronautical Rescue Coordination Centre". Retrieved 2008-02-24. ↑ Royal National Lifeboat Institution (2009). "Royal National Lifeboat Institution". Retrieved 2009-11-06. ↑ BBC (2006-05-09). "Private bids plan for air rescue". BBC News. Retrieved 2008-02-24. ↑ "Press Release". Soteria SAR. 9 Feb 2010. Retrieved 6 April 2010. ↑ "Search and Rescue (Helicopter) Project". Dft.gov.uk. Retrieved 2012-06-28. ↑ "UK Government suspends SAR-H helicopter programme - News - Shephard". Shephardmedia.com. 2010-06-17. Retrieved 2012-06-28. ↑ "Search and rescue helicopters". Department for Transport. 26 March 2013. Retrieved 2013-03-31. ↑ Cheshire Search and Rescue (n.d.). "Cheshire Search and Rescue". Retrieved 2016-04-11. ↑ LAMRT (May 2011). "Langdale Ambleside MRT". Retrieved 7 May 2011. ↑ Lincolnshire Urban Search & Rescue (n.d.). "Lincolnshire Urban Search & Rescue". Retrieved 2009-05-22. ↑ SULSAR Search & Rescue (April 2015). "SULSAR Search and Rescue". Retrieved 2009-10-18. ↑ Surrey Today (January 2011). "Volunteers needed to aid search and rescue". Retrieved 20 June 2011. ↑ SEBEV Search & Rescue (November 2009). "SEBEV Search and Rescue". Retrieved 2009-10-18. ↑ Section ESF #9-1 Archived December 11, 2013, at the Wayback Machine. 1 2 O'Toole, Thomas F. (n.d.). "Committee F32 on Search and Rescue". Retrieved 2008-02-24. ↑ "Hệ thống thông tin VBQPPL". moj.gov.vn. Retrieved 6 March 2016. ↑ "Xây dựng lực lượng cứu hộ-cứu nạn chính quy và hiện đại". VOV - ĐÀI TIẾNG NÓI VIỆT NAM. Retrieved 4 July 2015. ↑ Administrator. "Tรกยปย• chรกยปยฉc bรกยปย mรยกy lรกยปยฑc lรยฐรกยปยฃng Cรกยบยฃnh sรยกt phรยฒng chรยกy vร chรกยปยฏa chรยกy". canhsat.vn. Retrieved 26 February 2015. ↑ "Archived copy". Archived from the original on 2016-10-14. Retrieved 2015-02-26. ↑ "Tìm kiếm cứu nạn (SAR)". vatm.vn. Retrieved 26 February 2015. Wikimedia Commons has media related to Search and rescue.